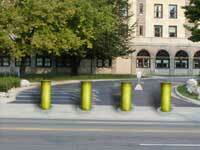 Where The World Can Find Rapid Response "bollards "For Less !! Protect your facilities and deny access to secured areas. In Many gated areas the close response time of a slide gate is not fast enough to prevent tailgaters from entering restricted areas. For this a Barrier can be activated to go up, once the exit loop is crossed on entry, coming throught the slide gate preventing any further unauthorized vehicles to enter without the proper clearance. operated by Card access, key pad entry etc. With our systems integration expertise, our software can provides you with online security device status and controls. Systems will interface with existing or new applications such as keypads, card readers, loop detectors, and other traffic control and monitoring systems. System installation includes onsite hardware and software, direct or wireless communications with security devices and central system reporting and management of multiple sites locations. The Security Products Unlimited Model 400 retractable vehicle barriers were developed through a Department of Defense research grant to provide complete area denial and perimeter security protection. Certified by the United States Department of State to stop a 15,000 lb. vehicle traveling at 50 mph., the K12-rated Model 400 barriers are used as the first line of defense for valuable assets. These innovative barriers are self-contained, eliminating the need for a central pump station and making the barriers uniquely easy to install, operate and maintain. Rapid-response barriers can be seamlessly integrated with new or existing perimeter security and facilities access equipment, including NIST Government Smart Card access control systems, traffic signs and loop detectors, motorized gate arms, digital video networking systems, and a variety of other vehicle sensors. Custom solutions can also be designed. The Security Products Unlimited Model 300 retractable vehicle barriers were developed through a Department of Defense research grant to provide complete area denial and perimeter security protection. Designed to stop a 15,000 lb. vehicle traveling at 30 mph., the Model 300 barriers are used as the first line of defense for valuable assets. These innovative barriers are self-contained, eliminating the need for a central hydraulic pump station and making the barriers uniquely easy to install, operate and maintain. The Security Products Unlimited Model 100 retractable traffic control barriers were developed as a safe and easy way to redirect traffic. Designed to withstand the punishment of repeated impacts, the Model 100 barriers are used in situations where repetitive changes in lane usage or traffic flow patterns are required. The state-of-the-art barriers are housed in self-contained cartridges recessed in the ground and are uniquely easy to install, operate and maintain. Retractable barriers can be seamlessly integrated with new or existing perimeter security and facilities access equipment, including NIST Government Smart Card access control systems, traffic signs and loop detectors, motorized gate arms, digital video networking systems, and a variety of other vehicle sensors. Custom solutions can also be designed. toll collection lanes, weigh stations, parking lots, tunnel and bridge entrances, railroad crossings, HOV lanes and reversible lanes. Security Products Unlimited' system design and engineering services provide clients with a wide range of custom security and traffic control and monitoring solutions to help provide integrated protection for facilities, assets and people. Utilizing solid-state controls and cutting edge communication technologies, Security Products Unlimited' systems can be designed to seamlessly integrate perimeter security and facility access control systems, including NIST Government Smart Card access control systems, traffic signs and loop detectors, motorized gate arms, digital video networking systems, and a variety of other vehicle sensors with existing access control systems. Security Products Unlimited' flexible control and monitoring systems can be operated through a direct connection, or wirelessly utilizing high-speed ethernet radio or satellite. Security Products Unlimited offers its customers a complete menu of equipment installation and maintenance services. Leveraging the expertise and resources of National Realty, a 25-year old full-service reality and construction management company, Security Products Unlimited offers customers a suite of services ranging from installation oversight to turnkey installation management and system maintenance, service and support. 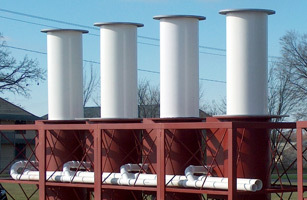 While Security Products Unlimited' traffic delineation and vehicle barrier systems are extremely low-maintenance by design, routine maintenance services including brush replacement, electrical connection checks, cylinder debris removal and system cycle tests should be conducted to ensure that equipment stays in excellent operating condition at all times. The delineator was developed as a safe and easy way to redirect traffic, especially where repetitive changes in lane usage or traffic flow patterns are required. Typical applications include toll collection lanes, weigh stations, parking lots, tunnel and bridge entrances, railroad crossings, special lanes and reversible lanes. This amazing new structure eliminates crew exposure to hazardous situations during traffic flow changes. The delineator eliminates an unsafe situation for workers while placing pylons, drums or vertical panels. The delineator is constructed of a durable, flexible-channeling pylon that is housed in a self-contained cartridge recessed in the ground. It is easily raised or lowered into the cartridge as needed. This unique patent pending design withstands collisions with vehicles because of its flexible pylon and drive system that utilizes a smooth bore shaft and linear actuator. When bumped, pushed or hit, the motor drive system is protected by a linear clutch, alleviating the need for repair or replacement, unlike some competitor brands. The delineator uses low power (24 volts) that results in easy and low cost operation. It can be operated by our Its FM radio system, direct connection or remote. This alleviates the need for manual operation, which is time consuming, labor intensive, and the Its-delineator keeps workers from harms way. Each delineator can be individually controlled or as part of a cluster of delineators, which takes commands from a single control unit. Its delineator utilizes a patent pending, smooth bore drive system that provides a working level of linear thrust needed to raise and lower the pylon. It acts as a linear clutch by breaking free when the present load limit is exceeded. When the downward thrust load exceeds the present limit, the pylon and actuator slSecurity Products Unlimited downward on the shaft until the source of the download is corrected. The motor housing of the Its-delineator is completely sealed from the environment. The drive system and inner cartridge are designed to operate in submersed conditions if necessary. The product can be equipped with optional 24V foil heaters sealed in vulcanized rubber, which prevent ice accumulation with in the product or above the product on the surface roadway. The delineator is equipped with a thick, circular nylon brush, that encircles the pylon periphery and prevents roadway debris from entering the product and fouling the mechanical systems. Designed to withstand the worst punishment and still protect your assets. 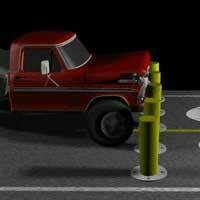 This delineator can be used for area denial or as the first line of defense against attacks. Easy to use and install, this could be the answer you have been looking for. Can be controlled by - simple UP/DOWN button, keypad access, card reader, direct wire, phone, wireless or web-based interface. Or we can design a custom solution for you. THE rapid response barrier systems meet all military requirements for K-12 area denial and deploy in less than six seconds. Unlike unsightly, bulky and hard to position Jersey Barriers, our 400 Rapid Response Delineators hide in the ground, out of sight and mind until you need to deny access to your assets and personnel. Unbelievable yet true, at the press of a switch you have secured your assets in less than six seconds with a sophisticated barrier able to stop a 30,000 lbs vehicle (truck) traveling 50 miles per hour. Built with the finest of available technology today, this product has a long life and can be used multiple times on a daily basis as a gate to control access (denial) to your parking lot; to establish a perimeter around your warehouse or office building in order to protect your people and assets from a possible terrorist attack. Designed to withstand the worst punishment and still protect your assets. 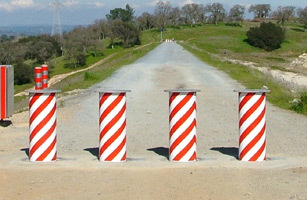 This delineator can be used for area denial or as the first line of defense against attacks. Easy to use and install, this is the answer you have been looking for. This system becomes one of the most powerful security tools you could ever own. 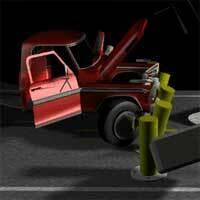 � K-12 Certification - Stops a 15,000 pound vehicle at 50 MPH with a safety factor of 2.